Average Height	: 18" - 20"
Average Weight	: 25 - 28 lbs. It is believed that the Irish Terrier is one of the oldest terrier breeds. The breed is thought to be two thousand years old, but the earliest images we have of it is in a painting from the 1700s. The exact breeds it descended from are unknown, but they were originally found in Country Cork, Ireland. 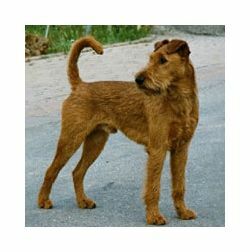 The Irish Terrier was used to hunt den animals such as otter and water rats, and as a retriever and wartime messenger. The Irish Terrier was recognized by the AKC in 1885 and a United States' breed club was started in 1896. Some of the Irish Terrier's talents include: hunting, tracking, retrieving, ratter, watchdog, guarding, police work and military work. •	This is an alert, spirited, adaptable dog. •	Devoted, independent, strong-willed and smart. •	Love people and friendly to strangers. •	Not great with other pets. Can be ‘scrappy’ & aggressive, and do not back down. •	Can be considered to be a “Barker”. •	Lots of Energy, need mental & physical stimulation. •	Obedience Classes a Must. Not great at ‘coming’ when you want them to. •	Can be dominant & have a ‘take charge’ attitude within the household. •	Moderate exercise required, and a great escape artist. •	Low Shedder, Hypo-Allergenic ~ great for those with allergies. •	Are not Great with Cats if left alone, unsupervised. The Irish Terrier has a personality all its own. Owners should understand that this hot little package can be very hot-tempered when it wants to be. It can also be very reckless in such activities as chasing cars or larger animals. One of its most endearing benefits is that it can be extraordinarily courageous. Even though this breed can be energetic and very spirited, they can also be some of the most loyal dogs that you can bring into the home. When cared for properly they can be very affectionately and loving with those people and family pets that it has been around and is familiar with. The healthy Irish Terrier will play hard and is a good companion for active children. The breed is by nature curious and bold in equal measures. It should be noted however that the breed can be somewhat willful at times. Owners who are new to the Irish Terrier should keep in mind that it is normal for this breed to be feisty to the point of being a daredevil. This breed has been known to protect its owner and family to the point of death. It will rarely back down when it feels the owner or family is being threatened. This loyalty to the family makes this one of the best guard dogs available. But while it makes a great guard dog, it should be remembered that it also makes a fine companion as it is loving and respectful to its owner and family. This breed can become very devoted and that makes it one of the endeared breeds known. The Irish Terrier is a generally healthy breed. For this breed, eye and breathing ailments are rare. They are not prone to Allergies as other breeds may be, but they must be checked for fleas and ticks regularly as they love to hunt out of doors will get into the bushes and thickets. Because of their small size they are not very prone to hip dysplasia. For the most part, the Irish Terrier is easy to groom. When groomed properly, the Irish Terrier coat will protect the animal from rain and cold. The Irish Terrier does not shed when the coat is groomed properly. It is important to remember that the coat should not be washed too often, as shampoos will also reduce the natural skin oils that help protect the animal. The best rule of thumb is that most Irish Terriers only need washing when dirty. It is important to remember to clean the teeth. If the owner is not able to perform this grooming task, a pet salon should be used. Proper dental care is extremely important as it helps your pet to keep its teeth for as long as possible. Ear cleaning is easy. For general cleaning, you can use baby oil and a cotton ball. Take special care to not go too far into the ear as you could damage the ear drum. It is best to gently wipe around the outer ear and remove any debris that you may find. Many new owners of the Irish Terrier will want to learn the techniques needed for coat grooming from a pet salon. This is a great way to learn the skills that you will need. The Irish Terrier was bred for long, active work. They love activity and they love to run and play when they get the opportunity. The healthy Irish Terrier needs plenty of exercise and this exercise should be taken on a routine basis. One of the best ways to exercise this breed is the walk. Owners should always make sure that they have the animal on a leash when walking so as to avoid the possibility of a fight should your dog happen onto another dog. The Irish Terrier can live very well in apartments. Unless provoked, it does not bark unnecessarily. It can be housebroken easily and it makes a calm, quiet companion for most elderly people. However, because the Irish Terrier loves to run and hunt and play it does better in homes that have outdoor areas for it. For those homes with a back yard, the use of a fence is almost mandatory for this breed. The fence used needs to be sturdy and it should be at least five to six feet high. The Irish Terrier loves to jump and will happily jump the fence if allowed to. It is important for all owners of this breed to understand that this animal needs exercise in order for it to remain fit and it will often dig into the ground in order to get that exercise. It will certainly try to dig under your fence so make sure the fence is secured top and bottom. The breed does well in all climates and it can be left out of doors although it would prefer to be with the family indoors. The Irish Terrier is a very Intelligent and trainable breed, but owners should understand that this breed can be somewhat stubborn and willful. The best way to train the Irish Terrier is to train it firmly and from an early age. Owners must understand that while the Irish Terrier can be very affectionate with people they can be very combative with other dogs and they should not be trusted with non-canine pets such as rabbits or cats. The Irish Terrier has a strong protective instinct, so he should be socialized well with people at an early age so as to avoid instances of biting and snapping. While it is not always a problem with all dogs, some of this breed can be difficult to housebreak. Owners must understand that the Irish Terrier likes to dig, explore, and chase things. These are issues that the owners can train against but the owner should not get his or her hopes up too high. For some owners the best way to begin training of this breed is to go to a professional trainer. Once the professional trainer has laid down the basics, the owner can begin training at home.